Many of us have lived in the Midwest for all of our lives. However, even if you’re new to the area, you’ve probably already realized how quickly the weather and temperature can fluctuate. Shifting weather, especially in the colder months can mean snow storms, frozen powerlines and, inevitably, power outages. According to the U.S. Energy Information Administration, the typical American household loses power once or twice a year for an average of three hours. However, as many of us saw and experienced last winter and even this summer for that matter, these outages can last much, much longer resulting in frozen plumbing, spoiled food and potentially a dangerously cold home. A great way to make sure you are prepared in case of emergency power outages is a home power generator. Doug’s works in conjunction with highly skilled electricians during the installation process to ensure the shortest time between power loss and when your generator kicks on. Installation requires the addition of a new electrical box that allows your generator to tap into your home electrical system where it can monitor power flow and automatically turn on when needed. The average unit will typically only take about 30 seconds to detect and begin delivering power to your home which means you spend less time in the dark and more time staying safe and warm. Now, you may be wondering “How do I know which generator is right for me?” and that is a common question we get. Generator power output is rated in watts and kilowatts (1,000 watts = 1 kilowatt) which will help you determine if their power output is enough to suit your needs. Do you just want to make sure the bare necessities work while you wait for power to be restored? If yes, you’ll likely be able to get by with a smaller generator; however, if you want your whole home to run as it would normally, you will need a much larger generator. Make a list of all the appliances you need/want powered if you were to lose electricity. Determine the starting and running wattages of each appliance on the list. Things like your refrigerator have a high starting power need, but require less power once up and running, a laptop or computer will tend to require the same amount of power from start to stop. Owner’s manuals can be a great resource for this information. Add up the totals for starting and running wattages and you will have a rough estimate of your power needs. 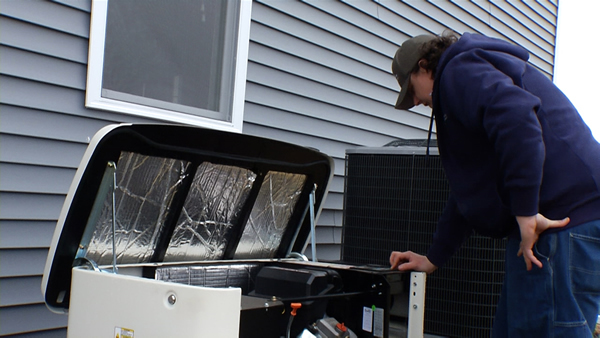 Of course, speaking with a professional is the absolute best way to determine your exact needs, ensure proper installation and keep your generator running at its best for years to come.